Thrown off course by a howling storm, the TARDIS lands in a bleak, desolate stretch of countryside. The Doctor deduces that it has arrived in Hampshire in the 1920s and, sniffing the air, he smells a distinct odour of sulphur - indicating that a spaceship has crashed in the area. While Rory goes to fetch an umbrella, Amy and the Doctor brave the rain to find the stricken craft. It is huge, shiny, silvery-blue - and completely empty. A set of footprints leads to a cosy-looking, old-fashioned cottage: but the house, too, is deserted. However, the Doctor and Amy can distinctly hear people talking - and one of the voices sounds like Rory's. How could he be in the cottage when he was last seen heading back to the TARDIS? Where are the residents of the empty house? And what has happened to the inhabitants of the spaceship? 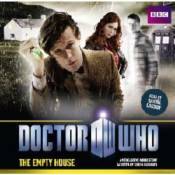 Raquel Cassidy reads this exclusive audio adventure featuring the Eleventh Doctor, Amy and Rory.